Gold Note of Florence/Italy are a full-service shop. From cartridges to tone arms to turntables, from CD transports to CD players to DACs to servers, from preamps to amps to cables to speakers, even racks... one could build an entire system from gold and never set foot outside the ancient city on the Arno river. It's the capitol of picturesque Tuscany which since the 19th century enjoyed the designation of Italy's Athens for its role in the cultural Renaissance. Thus the company slogan The Renaissance of Technology. Today isn't about history though; unless their latest floorstander, the XT7 three-way, were about to make history. Like boats of course, speakers are more likely viewed as females so it'll be her not his story. And so it all began; with a custom air-motion transformer shaking hands with a 15cm mid and dual 18cm woofers. All cones here are of the "ultra-hardened woven polypropylene" sort. Filter points sit at 280Hz and 3kHz. Four finishes cover high-gloss black and white cheeks; and Walnut and stained gray wood veneer. 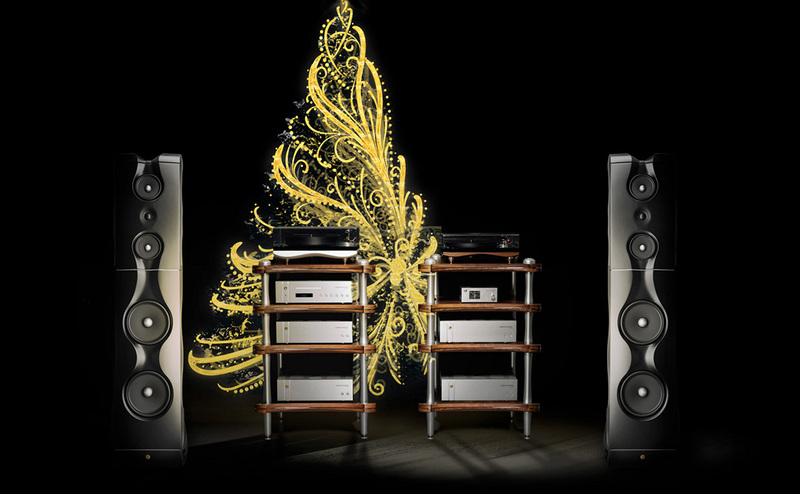 Gold Note's 2016 Xmas & New Year's card shows their full-line resources in a complete system. Italian designers are fêted for their style, making Milan the fashion centre of Europe. As their stock images show, the XT7 isn't about to dent that shiny reputation. It cleverly disguises its intrinsic box nature with wavy side-edge scallops, then throws an additional curve into the mix with its plinth's frontal profile. It's an elegant construct and attractive Tonmöbel; two pieces of sound furniture you'll not struggle to share your living room with. 7" woofer diameters support a narrow baffle which plays to contemporary ideals whilst two of them net cone surface roughly equivalent to a 10-incher, spreading half the excursion requirement over two motors. This is how things look on paper: 35-30'000Hz bandwidth; 90dB sensitivity; 4Ω nominal impedance; 30-300w power handling; suggested minimum sitting distance 1.5-2m; 111 x 36.5 x 52.5cm HxWxD; 50kg/ea. (120kg/pr ship weight). The integral twin-cab design creates sealed loading for the head unit and rear-ported loading for the twin-woofer base. The 30-parts xover with Mundorf and Clarity issue populates a glass-fibre board with aircore coils, graphite resistors and silver/gold caps. Sourced from Seas of Norway, the 15cm midrange sports their signature metallic phase plug to "reduce compression from voice-coil temperature variations" whilst a heavy copper ring around the voice coil "reduces distortion and intermodulation". The injection-moulded metal basket sports large openings above/below the spider to "reduce reflections, air flow noise and cavity resonance". The 18cm Seas woofers apply the same recipe to bass duties. Hookup is via biwire terminals.